The Flying Start® Pin Feeder allows you to feed one medium cylinder or two of the stackable cylinders. This will attract all the smaller clinging birds like the chickadees, nuthatches, and woodpeckers. The Looped Perched Cylinder Feeder is also designed for our small cylinders, but easily holds the larger ones as well. Large loops at the bottom allow non-clinging birds to feed with ease. The Dinner Bell™ holds the medium cylinders comfortably but also has a cover and tray. The tray can hold additional foods like seed, mealworms, or suet nuggets below the cylinder. And our all metal Decorative Seed Cylinder Feeder is the most popular seed cylinder feeder by far. This feeder can hold any size seed cylinder, is easy to fill and clean, and has a beautiful perching branch for the cardinals to comfortable feed at the cylinder. You can also add an optional tray. 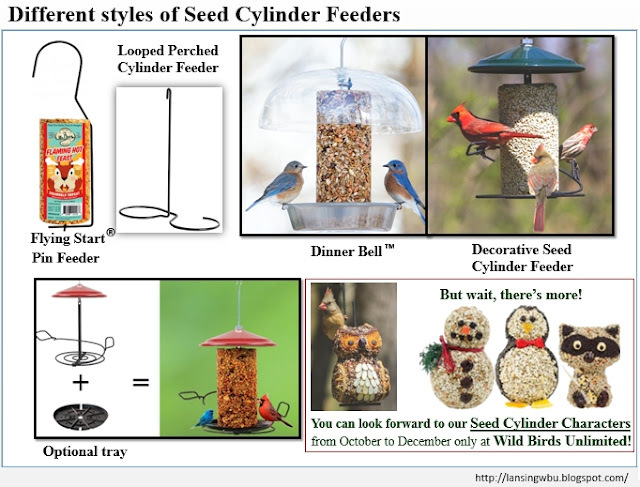 And just when you thought cylinder feeding couldn’t get any better...you can look forward to our Seed Cylinder Characters from October to December only at Wild Birds Unlimited!